What do I know about health care? I’m a physics writer. I’m certainly not qualified to evaluate the accuracy of “Sicko,” Michael Moore’s forceful indictment of America’s for-profit health care system. 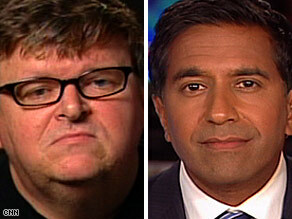 Who knows, perhaps Sanjay Gupta, CNN’s telegenic brain surgeon, had a point on July 11 when he attacked Moore’s new documentary for being sloppy on the facts. But when I saw Moore’s subsequent CNN interview — carried on live at Moore’s insistence, to avoid being edited — I sat back and relished the moment. It’s true that Americans get hip replacements faster than Canadians. But there’s a funny thing about that example, which is used constantly as an argument for the superiority of private health insurance over a government-run system: the large majority of hip replacements in the United States are paid for by, um, Medicare. That’s right: the hip-replacement gap is actually a comparison of two government health insurance systems. American Medicare has shorter waits than Canadian Medicare (yes, that’s what they call their system) because it has more lavish funding – end of story. The alleged virtues of private insurance have nothing to do with it.